About The Reel Blues Fest, Inc. The Reel Blues Fest was founded because there was a need to promote the classicly American musical tradition of The Blues and a need to use the proceeds from blues events to enhance the needs of the artistic community which surrounds the musical genre. The Reel Blues Fest, Inc. sponsors musical and film events from its base in New England and seeks entities and individuals who may need assistance such as older musicians who did not have financial or medical support through their careers and filmmakers and educational entities which need funding to promote the art and craft of filmmaking. 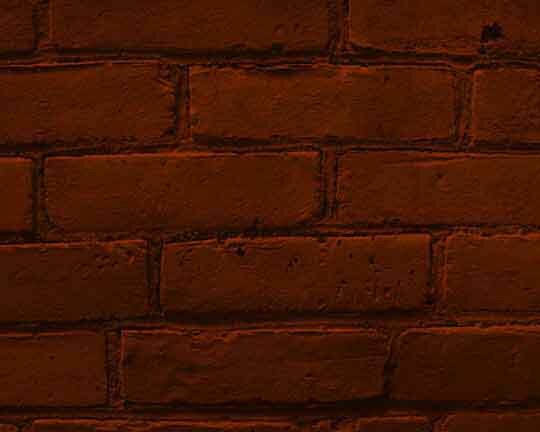 The Reel Blues Fest, Inc.
and/or copy and paste the following html into your site page. The History of The Reel Blues Fest, Inc. Seeing a need to promote the Blues and a chance to raise money to assist in the needs of older musicians and younger filmmakers, blues musician James Montgomery and Woods Hole Film Festival founder Judy Laster co-founded The Reel Blues Fest in 2001. Both saw a chance to present nique musical opportunites of bringing together blues talents for special one-of-a-kind performances. The first festival was held at the Air Station on Cape Cod. 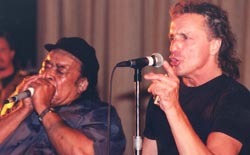 Playing to the sold-out crowd was the legendary “Superharp” James Cotton, teaming up with the talented blues musician James Montgomery. Also taking the stage were Jim Belushi and New England favorites Johnny Hoy and the Bluefish, Shirley Lewis and guitarist and producer extraordinaire Danny Kortchmar. The concert was preceded by a screening of the critically acclaimed film Genghis Blues, about an amazing journey by blues musician Paul Pena. Based on the success of the show, the 2002 Reel Blues Fest moved to a larger venue of Cape Cod Community College. The show opened with comic Lenny Clarke, setting the stage for the immortal Johnny Winter. The packed house couldn’t get enough of Johnny who was joined by James Montgomery to make it a memorable night. Mr. K.D. 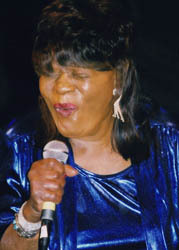 Bell and blues diva Shirley Lewis opened the show. The Fest included a screening of a documentary work-in-progress I Love You B.B. – about blues and hip-hop. Under a separate tent, the Reel Blues Fest featured a sneak preview screening from filmmaker Martin Scorsese of the PBS Series "The Blues. "™ Also screened was the documentary Honey Boy, about the life and times of Honey Boy Edwards. 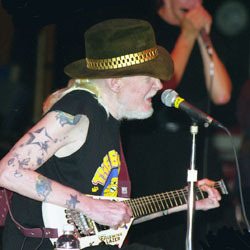 In 2004 the festival branched out with Dickie Betts, Koko Taylor, G. E. Smith, & Entrain playing at the Cape Cod Melody Tent and a two day blues fest at Six Flags Agawan headlining Koko Taylor, Johnny Winter, and Wilson Pickett. In order to enhance our outreach capability, The Reel Blues Fest is growing. For the future, we are looking forward to national and international growth. Your help and support will make this happen and help ensure that independent musicians and filmmakers are able to continue to produce the work that bring pleasure to so many. The Board of The Reel Blues Fest, Inc.
Judy Laster - co-founder (2000) Founding member of the Woods Hole Film Festival. Barry Miller - Photographer with Beshert Photography, Inc. The Reel Blues Fest, Inc. is a non-profit organization dedicated to helping musicians receive access to medical care and to supporting the work of independent filmmakers. Proceeds from events will be distributed to eligible 501 (C) (3) organizations pursuant to the guidelines established by The Reel Blues Fest, Inc.